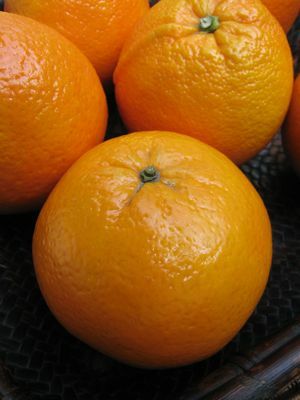 Superb Sagada Navel Oranges in Weekend Markets Now!!! A quick interruption of New York posts just to let you know I found two vendors last Saturday selling Sagada oranges. I have written about these wonderful oranges before, see this link, and I was thrilled to find them in Manila. Oddly, the last time I wrote about them was in the month of June, but it’s January now and they are still available, so I’m not sure when the “orange season” is in Sagada… hmmm. 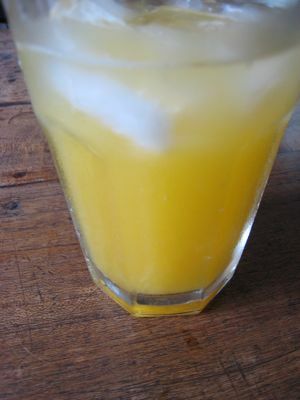 At any rate, they yield a light, sweet juice that is so incredibly drinkable, I can easily “drink 3-4” huge (1/2 kilo each) oranges in a flash. But even better, the last time I found these, we made really delicious candied orange peels. The oranges are not treated with wax as most commercially imported oranges are, so they are fragrant and perfect for candied peels. Boil, boil, boil in water and stew in sugar syrup, and you have candied orange peels… Simply roll the cooked peels in caster sugar, or leave them plain and eventually coat them with good dark chocolate…YUM. If I find some good pomelos soon I will attempt to do the same with the pomelo peels as well!!! Hi. Enjoy reading your website as my daughter introduced me to it these past few weeks. I love Sagada oranges and always make it a point to get some whenever we are in Baguio. may I ask w/c weekend markets you can find them at? Thank you and keep up the great work sharing your knowledge and experience with your readers! hi MM! i seemed to have been blocked from commenting :( i left comments on the roast beef dinner and it didn’t go through. anyhoo, it’s nice to know that there are such oranges avail in the metro. thanks for the info. Hi MM! Are there any other places where they sell these oranges aside from salcedo market? Thanks MM! Wanted to do this ever since I read your original post; however I’m a bit concerned as I think all the oranges available here in Beijing are waxed. That won’t work would it? Would this work on lemon peels? Orange and chocolate is my absolute favorite combination (raspberry a close second). I made candied peels back when i was in high school and they were bitter! Yes, I learned why when i was older. This inspires me to try again as I have some bittersweet belgian chocolate just waiting in the sidelines. Thanks for the vendor tip, MM! Mr MM, which weekend market did you found this? the Salcedo’s? neways, i’d love to try this candied orange peel next time and coat it with chocolate. YUM! You extended the life of the orange from juice to the rind – candied orange peel in the fullest life great for fruitcake and bread pudding. I wonder would it work if I use diff kind of orange, MM? This sounds like a fun activity with my little one, (after the boiling part, ofcourse) especially now that they’re learning the 3-R’s in school this would make a very good example! Thanks MM! hi marketman, i tend to peel first, then juice. 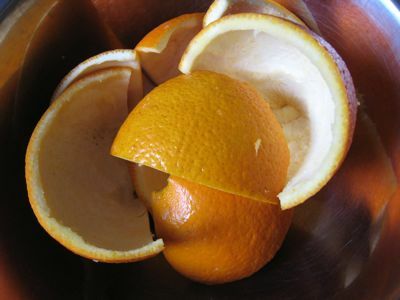 to peel, i slice off a little bit at one end so i get a flat bottom, stand the orange and peel from top to bottom using a fileting knife. 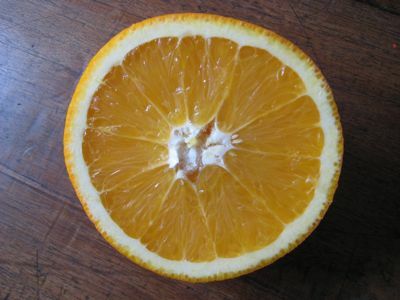 if i concentrate :) i can get it nearly ‘pithless’ and i end up with a skinless orange that is white in color (pith). to grace and others concerned with any chemicals sprayed on the fruit, may i suggest quick boiling the peel 3 times using cold water starts. 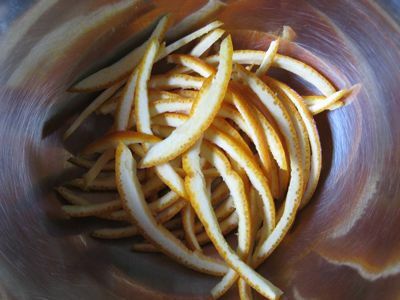 put the peel in cold water, bring to the boil, drain and repeat 3 times. after that, follow marketman’s recipe… i learnt this at cooking school. hope it helps. I feel like you are reading my mind, just last night I was thinking of asking my cousin (who is in Baguio every week) to find me these Sagada oranges (of course, I’ve learned about them from your site).. and then here comes this post..
now this is a bit different, and sorry if its out ot the topic. But I remember a friend who hails from Infanta Quezon gave me candied watermelon rind. I asked her how to do it, but she did not give it to me. I wonder if the process doing this candied orange peelings is the same. Any comments please. Thanks, MM. Looks like I’m not the only one who loves Sagada oranges. Looking forward to discovering more from your website. More power to you! love these oranges. last time i enjoyed these was also during the christmas holidays in baguio. I guess ’tis the season for sagada oranges. Found these wonderful oranges at the Baguio market half a year ago and they convinced me that our soil is actually capable of growing much better stuff that we think…have been serving them at Pepato for nearly 4 months now…they are 450gms a piece!!! huge!!!! i bought some from salcedo and they were really good. today i went to the legaspi market and got one last piece. feeling deprived, i went to Rockwell and checked if that fruit booth in the middle of the restaurant row at the ground floor had some. I saw the exact sagada oranges with leaves and stem just like the one in salcedo but 30 pesos more expensive. Just to make sure I asked the guy where the oranges are from and he said US. so I asked the male owner if these were sagada oranges and he said yes. Upon hearing us the lady owner said in a very palengkera voice: naku wala namang sagada oranges . Nagpunta nga ako sa baguio to order dahil madami ngang naghahanap pero yun pala wala. walang orange dito sa Pilipinas ! tinatanggal lang nila ang sticker etc etc…. i just got what i already unfortunately paid for and did not bother talking to her. Just wanted to ask if anybody knows if there are indeed sagada oranges ? well for me wherever the oranges came from marketman is right they’re really juicy and sweet. nothing like the other oranges I tried. and yes the one i bought from rockwell are exactly the same as the ones from Salcedo and Legaspi. I am so hot and bothered by the comments you mention at the Rockwell fruit stall. While there is no guarantee that oranges labelled “Sagada” oranges are from Sagada, they DO grow oranges in Sagada. And if the quality of the orange is notably better than the rest, as I have found whenever I buy Sagada oranges, then they are still worth it. But for the lady vendor to go the other way and downplay and even deny that Sagada oranges exist,let alone deny there are oranges in the Philippines, is just wacky. I dislike that stall intensely as I find that many of their fruits are 10-25% more than exactly the same offerings in Rustan’s, which is just 100 meters away (compare their driscoll strawberries, packaged blueberries and some of their apples, for example, and Rustan’s isn’t the cheapest, either)! I was once told by a restauranteur at Rockwell that he buys his fruit from that stall even if it is more expensive because and I quote “the owner’s child is sick with cancer” and he encouraged me to buy my fruit there… well, with a story like yours I would hope the owners know what they are saying to customers regarding oranges, or what their staff members are saying… that is simply outrageous! I will ask the same question you ask the next time I have a chance, and if the answer is equally inane, I will definitely write a post on it! Hey MM! i look forward to exploring and travelling with you. I know this is food blog but you guys travel alot as well. Amidst the recession and all that jazz, its nice to know that there are some people who still cares about the things that add spice to life, like travel and food. My husband, kids and I love these sweet juicy sagada oranges. Got them from Baguio, true sagada orange or not will still buy this variety.